Low alloy steels are defined as consisting of less than 10.5% Ni, Cr, Mo, and other alloy elements. In general, low alloy steels are required to be preheated to some temperature (TPH), prior to welding. It has been suggested that TPH for any given steel should be about 50 F above the martensite start temperature (MS) for the particular steel being welded. Most low alloy steels, however, have fairly high MS temperatures, making welding at or above them somewhat uncomfortable to the welder, thereby potentially compromising weld quality. For such steels, therefore, manufacturers often opt for TPH temperatures below MS. A case in point is AISI 4130 with an MS of 700 F; For this steel, federal, military, industry and company specifications typically list TPH temperatures in the 200-600 F range, all below MS.
Preheating drives moisture and other contaminants off the joint; moisture, lubricants and other contaminants are sources of hydrogen. More importantly, preheating serves to reduce the rate at which the metal cools down from the welding temperature to TPH. This is so whether preheating is above or below MS. Cooling rate reductions will lead to a general reduction in residual stress magnitudes, and also allow more time for hydrogen removal. Most low alloy steels that may be susceptible to hydrogen-induced cracking transform from austenite during cooling through the 800-500 C (1470-930 F) temperature range. The length of time a steel spends in this range during cooling, will establish its microstructure and, hence, its susceptibility to cold cracking. To maximize cracking resistance, a microstructure that is free of untempered martensite is desired; that is, the austenite would have transformed to ferrite + carbide and no austenite will be available to transform to martensite upon reaching MS.
For more information about preheating low alloy steels, contact Hotfoil-EHS at 609-588-0900 or by visiting their web site at https://hotfoil-ehs.com. and the integrity of the structure. 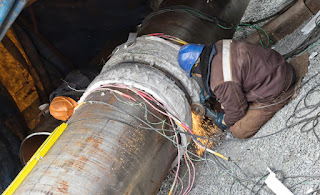 In any large scale welding operation (such as pipeline welding, shipbuilding, boiler fabrication) heat treatment is critical to the quality of a weld, and therefore critical to the performance of a structure, and never should not be taken lightly. When in doubt, review of industry code or a consultation with a welding expert is imperative. Welding code is the first determinant to whether pre-heating is needed. Welding code carefully specifies the minimum preheat temperature, the soak time, and the welding process. Many criteria are considered by welding codes, all gathered from years of rigorously tested data. This data is accumulated from many sources, including metallurgical science, chemical properties of materials, and radiographic analysis. In its simplest form, weld heat treatment is the process of heating the base metal (parts to be welded) to a desired temperature prior to welding, and then allowing it to cool at a given rate under controlled conditions. The specific temperature to which the part needs to be heated (before welding) is referred to as the “preheat temperature”. There are several key reasons why it's important to preheat before welding. A preheated part cools more slowly, which slows the overall cooling rate of the welded part. This improves the metallurgical (crystalline) structure and makes it less prone to cracking. Hydrogen that may be present immediately after a weld is also released more efficiently, which further reduces the possibility cracking. Preheating also mitigates stress from the shrinkage at the weld joint and nearby metal. 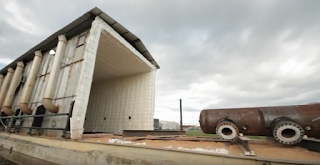 Pre-heating reduces the possibility of fracture during fabrication due to brittleness. Electric welding preheaters, known as "ceramic mat heaters", are rugged and flexible heating elements designed so that they conform uniformly around the weld and surrounding area. Ceramic mat heaters are normally controlled by a power console that uses thermocouples and electronic controllers to regulate, monitor, and many times record, the preheat temperature profile. Another less preferred method to heat the target piece is with a torch, or open flame, but this method carries safety concerns as well as controllability issues. Furnaces are also used, but these typically require the transport of the target piece off-site. Induction heaters offer an attractive alternative for safety, portability and controllability. Induction heating is unique because it uses molecular excitation as its source of heat, as opposed to open flames or external electric elements. Induction heating works very quickly, and since there is no contact with the target piece, there are far less concerns about part contamination. Many industrial processes use induction heating when very high temperatures and uniform control is desired. Each welding application has it's own unique set of circumstances which dictate the optimal heat treating method. It is always best to contact an expert and solicit their opinion on your best available option. As opposed to factory production, onsite production of large fabricated steel equipment could be the most cost-effective way to proceed on a large construction project. When you consider the costs of factory production, which includes complexities in permitting and approvals, logistics of materials and personnel, and most importantly transportation costs, the argument for onsite production starts to make sense. The benefits of onsite fabrication of large vessels, heat exchangers, condensers, sections of pipe, spool pieces or any other large item are compelling. Onsite manufacturing is complex, and requires localized production equipment and know-how. All aspects of the fabrication process which include engineering, material logistics, material preparation, field heating, welding, post heat weld heat treatment, and testing must be carefully considered. With regards to post weld heat treatment (PWHT), it is advantageous to have a large enough capability to do the stress relieving in one shot with a field erected heat treating furnace. 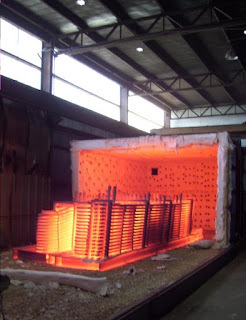 The most common approach for large part PWHT is to place the fabricated part inside the furnace and heat it to the required temperature in a single firing, as per procedure. This is the most desirable type of PWHT because all parameters in the heating, soaking and cooling can be carefully controlled. 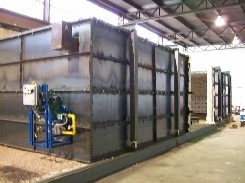 PWHT furnaces can be diesel, gas, or electrically fired, and can be built to accommodate very large work-pieces. Computer controls accurately ramp the item up to temperature, assure the required soak, and then cool the parts down according to specification. Custom furnace designs range from smaller low through-put sizes, to much larger rail-driven furnaces designed to move back and forth over the materials being heated. These larger furnaces may include crane wheels and drive systems, or even hydraulic lifting systems that lift the entire furnace for optimal transport and placement. If you have any questions about custom PWHT furnaces, contact Hotfoil-EHS for a no obligation consultation. Hotfoil-EHS has years of experience in the engineering, design, fabrication, and commissioning of large scale post weld heat treating furnaces with many successful installations around the USA. 2960 East State Street Ext. The goal of preheating and post weld (PWHT) heating is to maintain temperature between weld passes and to uniformly control changes in target temperatures. By properly achieving, maintaining, and then cooling weld temperatures, you lower weld stress, distortion, reduce shrinkage stress and allow unwanted hydrogen to escape. It is very important to understand the material characteristics of the metals being welded, and know minimum and maximum preheat temperatures, particularly in tempered steels. For most preheating, post heat treating, and interpass heating, precise temperature control isn't required. Its more important to maintain a minimum temperature, and stay within an acceptable range during the actual welding process, as well as during cool down. Exceptions are with tempered steels. Tempered steels have already been heat treated at the steel mill and applying too much preheat can alter that tempering. In these cases, proper set point, temperature limiting, and temperature ramp rate of the welded part is critical. 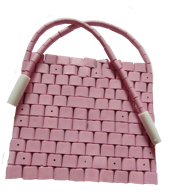 Resistance heating pads are constructed of ceramic beads strung on nichrome wire. These resistance heating elements accurately raise the workpiece temperature to the proper temperature before, during, and after welding, complying with recommended preheat, interpass, and PWHT practices. These semi-flexible ceramic heater pads, with their interlocking beads and high temperature wire, allow for a fit conforming to the shape of the workpiece, and are capable of temperatures up to 1,850 degrees F. Ceramic mat (pad) heaters have an additional benefit in that they don’t have to be moved during welding. welding preheat and post heat. Electronic temperature controllers use several thermocouples spot welded to the workpiece to monitor and regulate the actual part temperature throughout the operation. 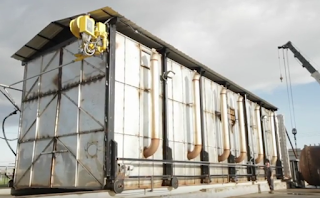 Many times the electronic controllers have ramping or temperature profiling capabilities, so that heat-up and cool-down can be carefully controlled. Recorders are often used to produce a record of the temperature profiles over time before, during, and after welding. This is important when welding jobs require careful documentation. An average application is as follows: the heater pad is wrapped around the workpiece, and insulation is applied to the weld joint and the temperature controller is set. 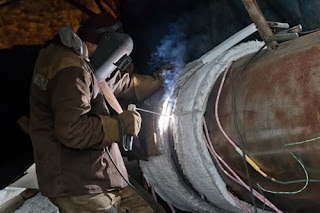 Once preheat temperature is achieved, a welder removes the insulation and starts their work. After the weld, the ceramic heaters can be placed over the weld and the controllers can be reset for proper PWHT.